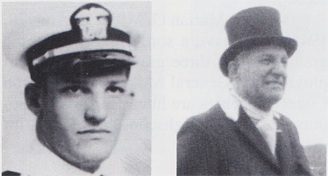 Eugene D. "Gene" Lamiman reported to the USS West Virginia after graduating from the USNA in 1940. During the Pearl Harbor attack he boarded the USS Tennessee to take control of her anti-aircraft fire. He was the first shipmate to visit CAPT Bennion's widow in Utah and answer her questions about the skipper. After serving in destroyers Shaw and Aylwin, he commissioned Barton (DD-722) as gunnery officer. At the Normandy Invasion shw worked so close to Omaha Beach that hers was the gunfire that silenced the cliff-top German guns that had our First Ranger Bn. pinned against the cliffs. Barton then screened fast carriers in the Pacific until Okinawa picket duty and shore bombardment. Lamiman ended the war in command of Philip (DD-498) then moved on to Woolsey. After serving as engineer officer of cruisers Providence and Roanoke, he commanded Braine (DD-630); taught engineering at the naval academy and served on the NATO staff in England. He was COMRADRON 2 when he retired in 1960 to join IBM. He worked on systems for the Trident submarine and commercial in-flight communications. He enjoyed some vigorous years, mostly around a horse, until his death in 1985, just days before the ship's reunion in Charleston, WV, which he had hoped to attend. His family includes a son, Del, in Maryland with two sons; a daughter, Ellen, in Washington state; a son, John, in North Carolina; and his widow, Charlotte Lamiman Patterson in Bethesda, MD.